Architecture firm OMA has revealed its previously unseen design for a shapeshifting new venue for London nightclub Ministry Of Sound. 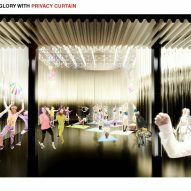 According to Rem Koolhaas' firm, it won a competition to design a new home for the world-famous nightclub back in 2015, but the project was unexpectedly scrapped shortly after. In a post on his Facebook page, OMA partner Ippolito Pestellini Laparelli wrote: "Apparently we won the competition (we were told so) but then surprisingly the project was cancelled." OMA was invited by Ministry of Sound to enter the competition, which called for a new building next to the club's historic location in Elephant and Castle, south London. Based on research from the firm's research studio AMO, the architects proposed a building that changes its shape from night to day, thanks to walls that mechanically lift up and down. This would allow the nightclub to easily change from open to closed, and to offer spaces that respond to different climate conditions. For instance, the indoor atrium would change to create a VIP roof terrace. 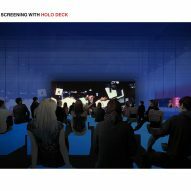 The design also addressed the fact – claimed by OMA – that nightclubs have lost their relevance, now that electronic devices are able to offer the same kind of immersive experience. The aim was to include as diverse a variety of spatial experiences as possible, to exaggerate the change from day to night. "The result of our work was a combination of a dynamic design – an experiment on a double identity – and of applied research into the status of nightlife and its spatial implications," said Pestellini Laparelli. Ministry of Sound was first established in 1991 in a converted office building. As "the first regulated 24-hour safe haven for partygoers to dance throughout the night", it offered an alternative to the illegal warehouse rave scene. The club went on to become a global brand, but over the years it has had several clashes with the local council over the redevelopment of its surrounding area, and has frequently claimed it was being pushed out. The company has not yet responded to Dezeen's request for comment as to why its competition for a new building was cancelled. But it is the latest in a series of problems for London's nightlife scene, which has seen many famous clubs shut down over the last decade because of licensing issues. Clerkenwell club Fabric almost closed down at the end of last year too, after two teenagers who took drugs at the venue tragically died, but the club reopened this week with stricter security. OMA and Rem Koolhaas ranked 12th in the Dezeen Hot List, a countdown of the most newsworthy players in the design industry. 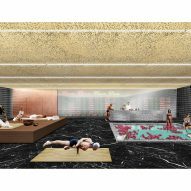 This isn't the first time the Rotterdam-based firm has designed a nightclub – the firm previously created a 1990s-style club in Paris to host a one-off event for fashion brand Miu Miu.